Marinate tenderloin with ½ jar of Spinelli’s Caesar dressing in a resealable bag and refrigerate overnight. Preheat oven to 400°F. Combine breadcrumb and parmesan in a bowl. Remove the tenderloin from bag and generously spread/pack mixture around tenderloin. Season with salt and pepper. Place the tenderloin on the oven rack with a rimmed baking sheet. 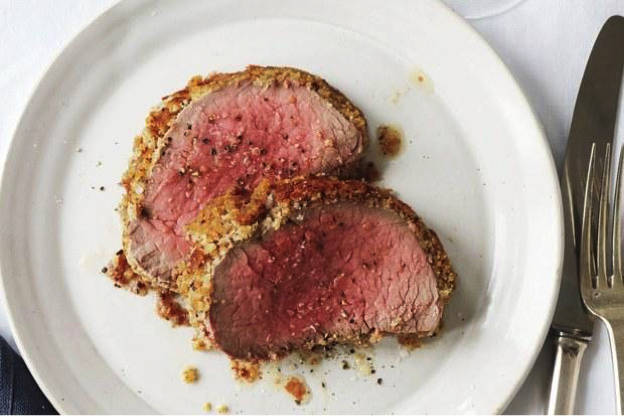 Roast until crust is golden brown and an instant-read thermometer inserted into thickest part of tenderloin registers 120°F-125°F for medium-rare, 30-40 minutes. Transfer to a carving board. Let rest for 20 minutes. Cut into 1/2″-thick slices. Serve with a side of rosemary garlic potatoes and a side of Spinelli’s Caesar dressing for dipping.